This size tent will fit up to 40 people around tables. 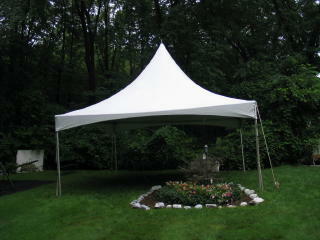 It is a frame tent so it can be installed on any surface, but is recommended for use on decks, patios and driveways. (Requires space 22″x22″). It is referred to as “pinnacle” because of the pretty sweep to the roof. Center peak is 18″ high. Sides poles are 8″ to 10″ and are adjustable. It has no center poles and is compatible with our 8″ tent sides.